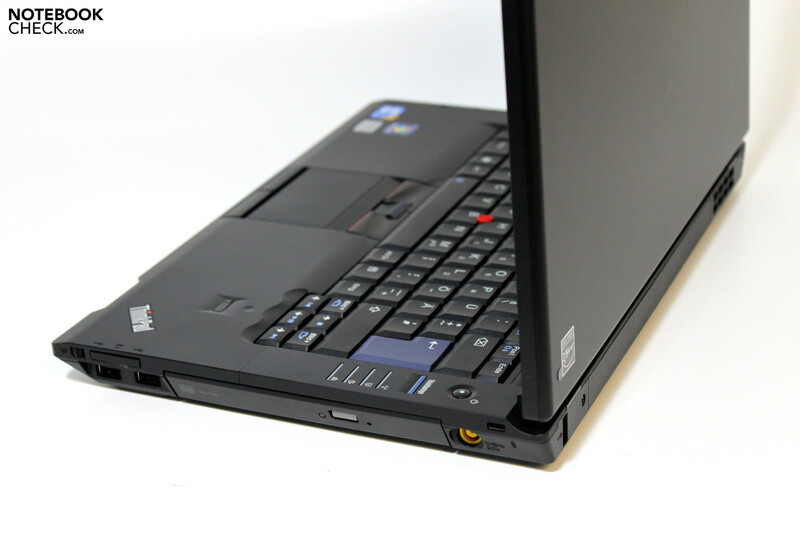 The L-series is a brand-new addition to the Lenovo Thinkpad notebook portfolio. Apart from the previously tested L512 there is also a more compact 14-incher with the designation L412. Being similarly equipped as its brother, it should score similarly in the mobility department. The product on offer and the one that we have in review is product number NVE5ZGE, specifically the 0530-5ZG. 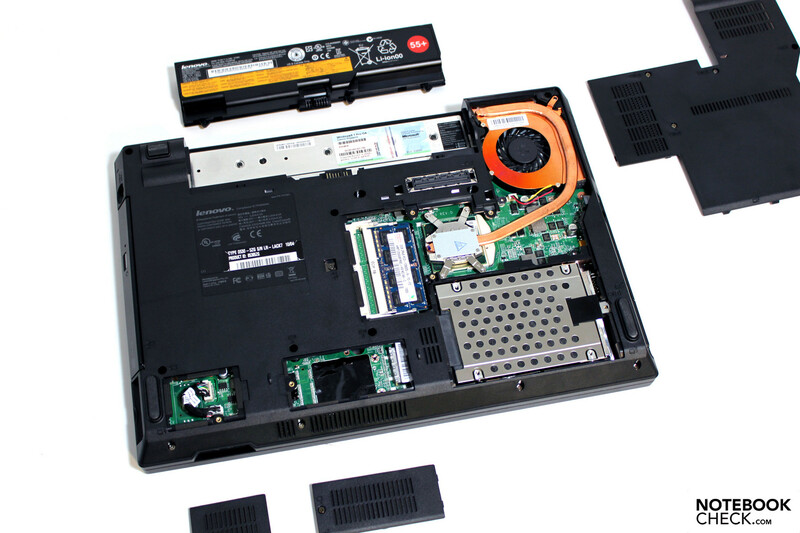 If you look at Lenovo's US website you can look forward to a built to order (BTO) model, making it possible to customize the L412 individually in a similar fashion to that of Dell. Possible configurations include a CPU upgrade to an Intel i5-540M chip, practically all of the Windows 7 variants, a memory upgrade up to 8GB and numerous hard drives of various configurations. Luckily many of these options would be able to be realized by an experienced user post-purchase. 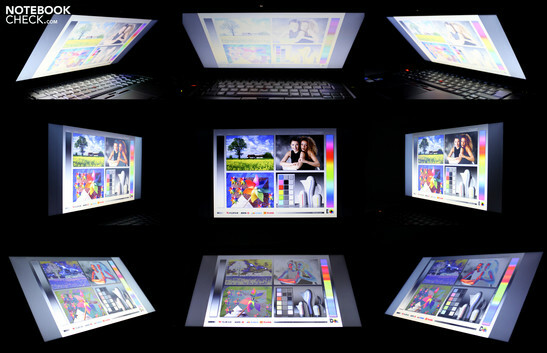 Similar to each model is the 14-inch anti-glare display with a resolution of 1366x768 pixels. The online configurator refers to an Intel GMA HD integrated graphics solution, though the tech specs make note of a possible ATI HD 5145 upgrade. 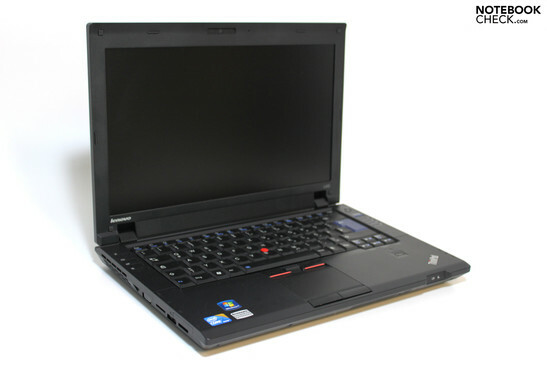 Optically the L412 is a copy of its larger colleague, the L512. With a length of 344 millimeters and a depth of 233 millimeters the case is also slightly smaller. The thickness of the notebook remains the same according to the manufacturer. With a weight of 2.3 kilograms one saves themselves from carrying a few hundred extra grams around with them on a daily basis. Looking at case stability, the smaller of the two models is certainly more stable. Unfortunately the underside of the base unit in the area of the optical drive is prone to deformations when under pressure. With a maximum opening angle of 120° the robust metal hinges work very well; furthermore, their elasticity allows the display to be unintentionally tipped over backwards. 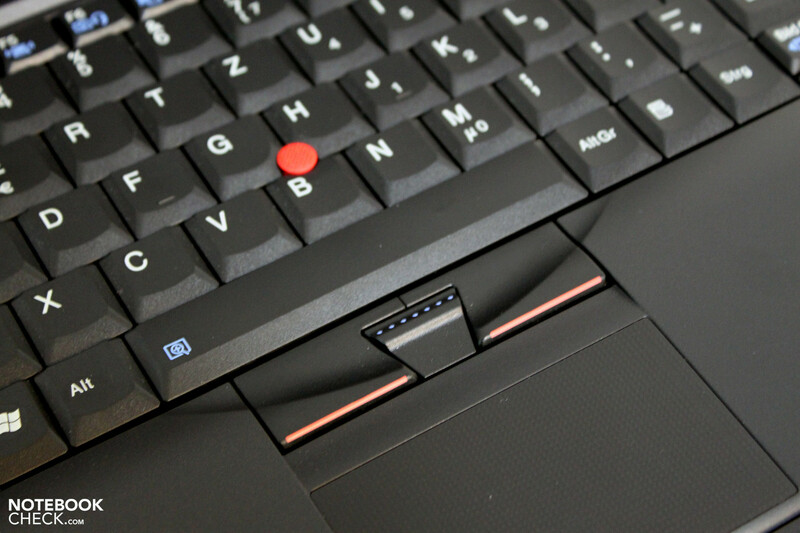 Lenovo stuck with the familiar clamshell design on the front edge which when closed lies directly on the base unit, held firmly in position by the hinges. The typical hook on the front edge which keeps the display closed during transport has been disregarded on the L-series models. The extent and positioning of each interface on the L412 belies its heritage, as the same ports are to be found in the same places on the L512. 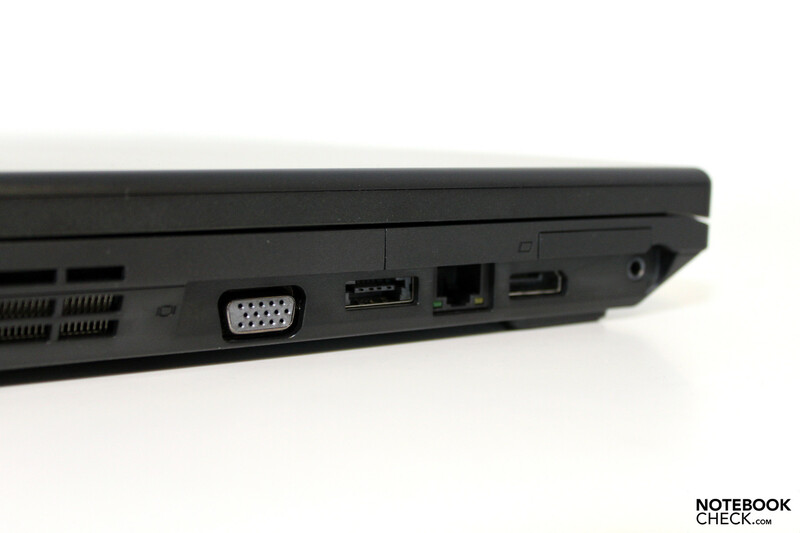 The included ports leave little to be desired; among others Displayport, eSATA and a docking interface are on offer. 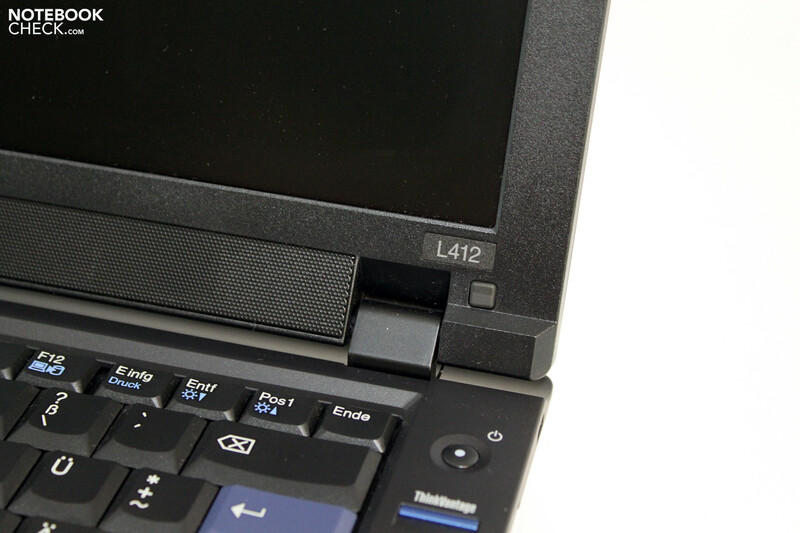 With respect to the positioning, the L412 draws some criticism, as left-handed users are faced with numerous ports on the front left edge which are only able to be accessed through the appropriate docking attachment. 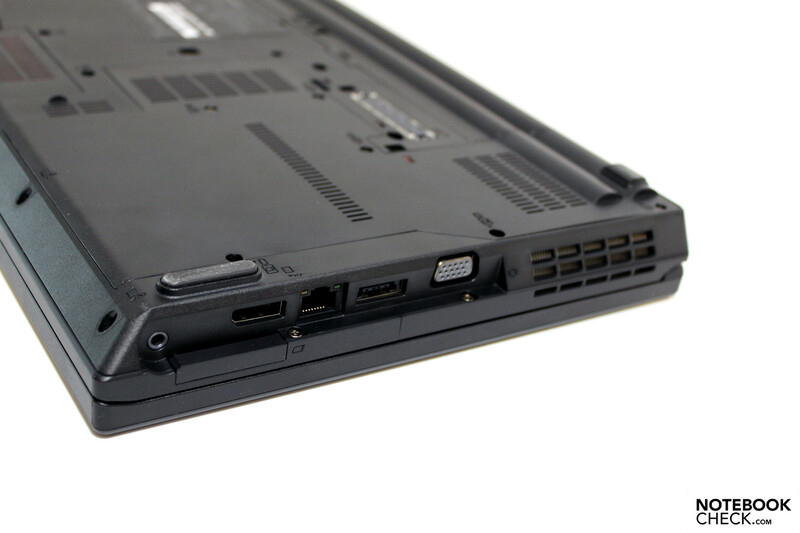 The same goes for the right side where the two USB ports are positioned to interfere with right-handed users. It doesn't help any that all of the ports are not flush-mounted with the upper edge of the device, rather positioned inward. This makes it difficult to plug in the devices correctly the first time, forcing one to look first. 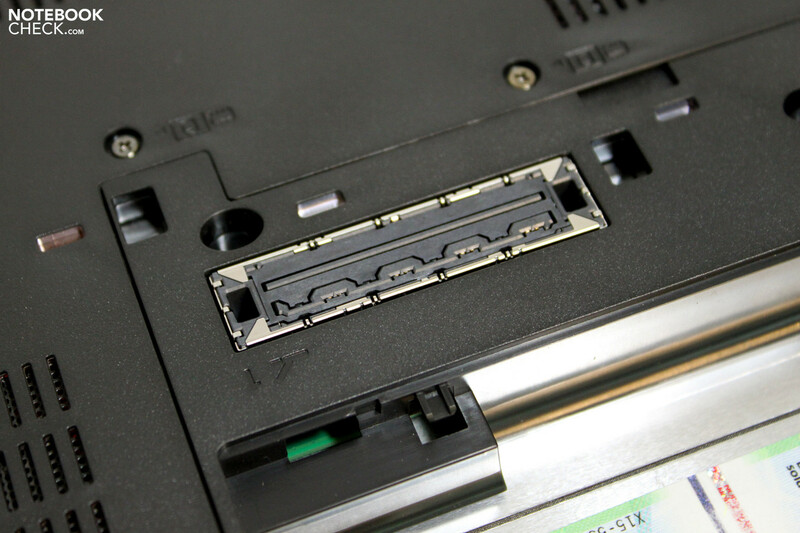 Also, wider devices such as some USB sticks will not fit into the side ports, whereupon one would have to resort to the powered USB port on the rear. The data sheet from Lenovo reads the same specs for the L412 as it does for the L512, apart from individual equipment having to do with mobile broadband internet or WiMax, which currently is only available in the United States. The model for the European market features a gigabit Eithernet connection from Realtek as well as an 802.11 a/g/n WLAN-module. Integrated bluetooth is also on board as standard. Worth mentioning is also the integrated 2 megapixel webcam, which offers a resolution up to 1600x1200 pixels. We found the comprehensive configuration options in the Thinkvantage menu very helpful; in this menu, exposure, white balance and color profile of the picture were able to be fine-tuned. The displayed picture is clear throughout and should provide excellent quality for video conferences. As was the case with L512, there was little extra in the carton other than the notebook, battery, AC adapter, power cable and a short instruction manual. 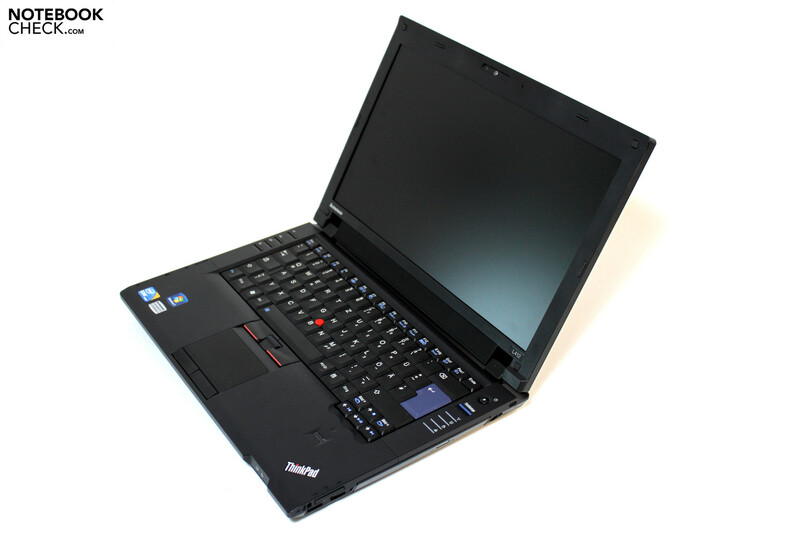 Extra hardware appropriate for the given model is available only at extra cost, though buyers should be sure to check compatibility as Lenovo has outfitted the current Thinkpad generation with many features and extras that are not compatible across the entire model range. 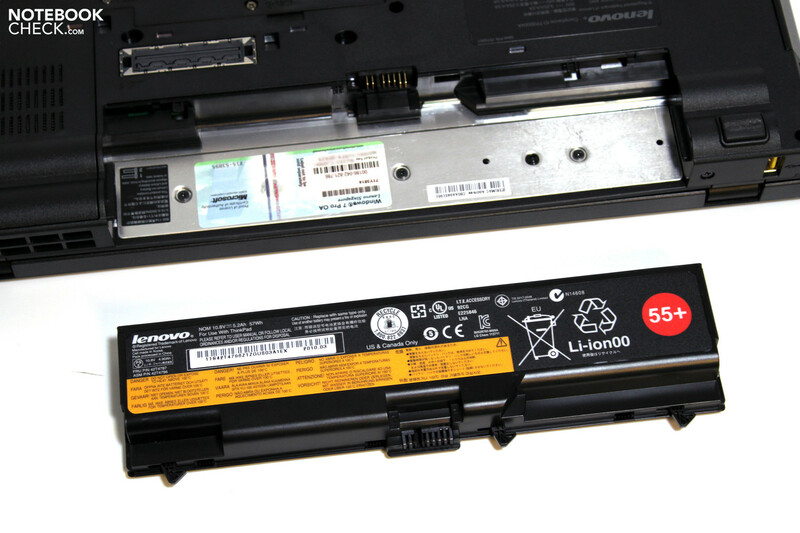 The warranty for the L-series specifies a 12-month bring-in service, which is to say that the user must send in the notebook for service when necessary. 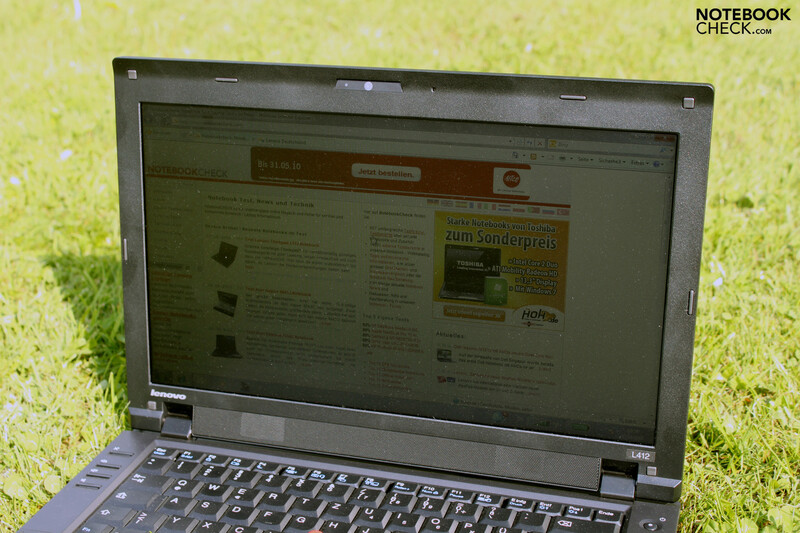 An warranty upgrade is possible including up to three years of on-site service, the cost of which is around 180 Euro. 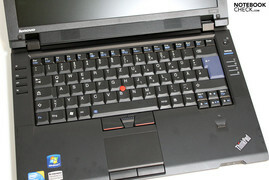 In comparison to the higher-class Thinkpad range, this is a cost-effective option. 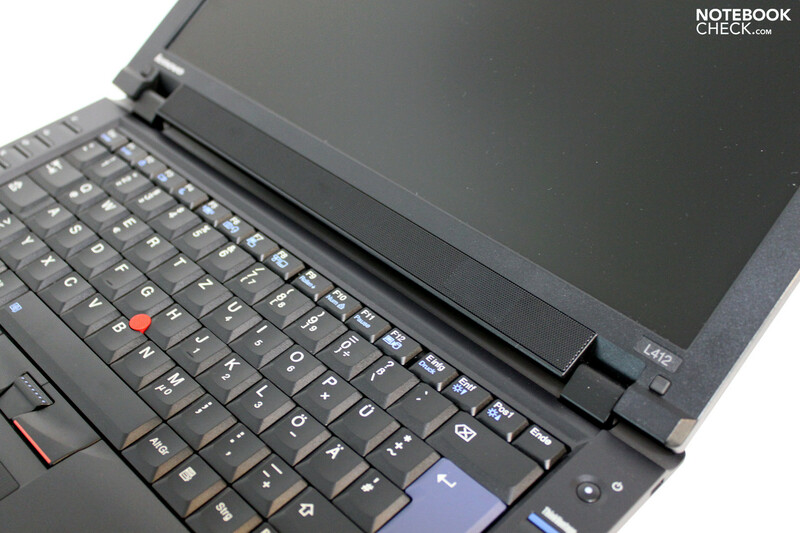 One can collaborate directly with our test of the Thinkpad L512 that this model uses an identical keyboard model. 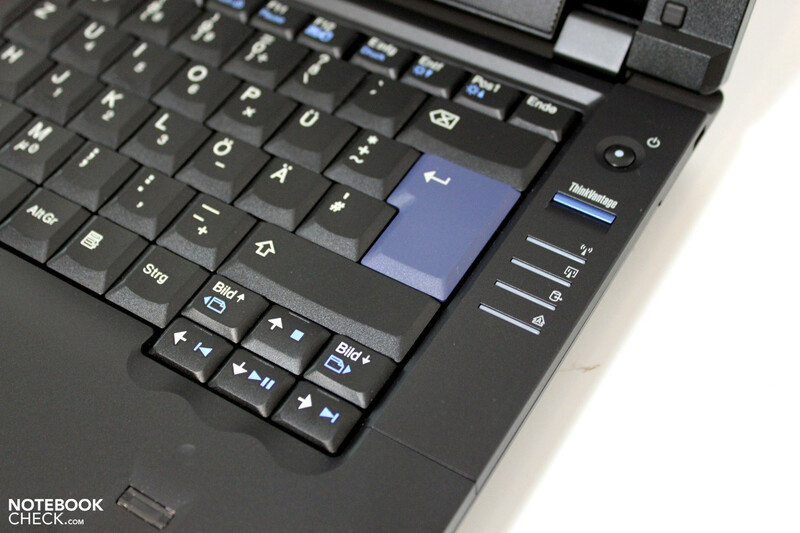 The differing sizes of the two models is remedied by having a varying amount of space to the left and right of the keyboard. 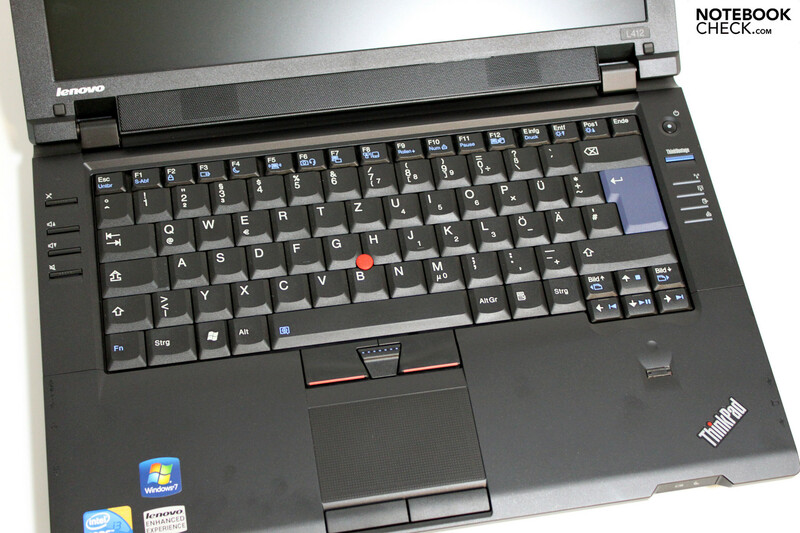 In short it can be said that Lenovo has integrated a typical Thinkpad keyboard into the L412. This observation covers not only the layout but the extent of the input devices (Touchpad and Trackpoint) as well as the haptics associated with their use. 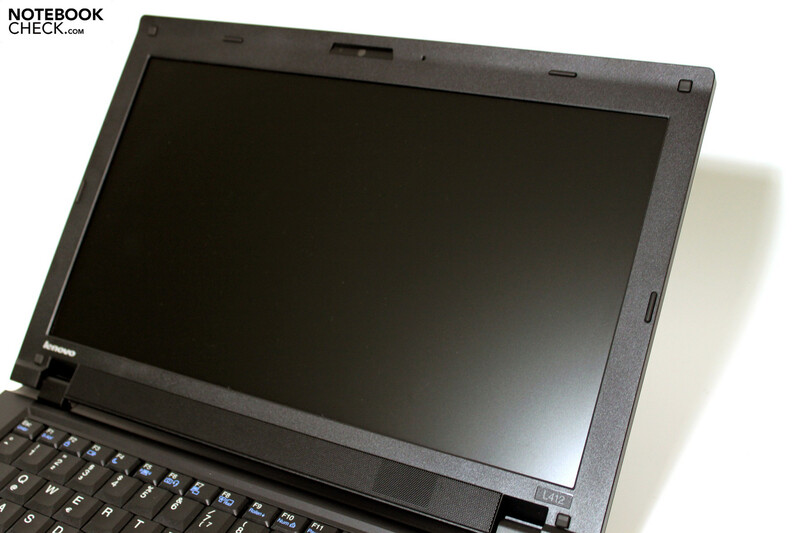 Although the 1366x768 resolution of the Thinkpad L412 remains the same as its L512 sibling, the detail of this resolution fits the 14-inch display size better than its colleague. A point of criticism for Office-users could be the 16:9 format display, resulting in a wider picture while sacrificing image height, which would be an advantage in many Office-applications. 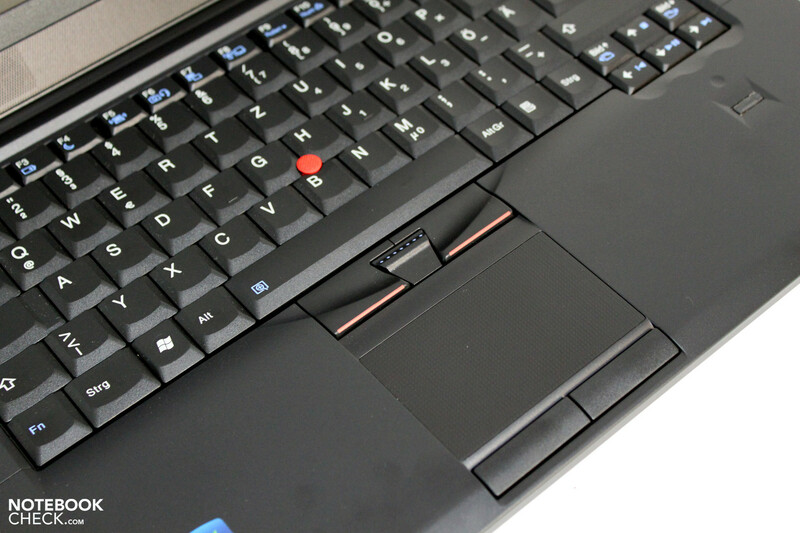 Utilizing a matte display finish, Lenovo has put a stop to the glossy experimenting and once again implemented an optically pleasing and ergonomic surface. The measurements of the available display (LTN140AT07401) are through and through better than those of its larger L512 sibling. The maximum display brightness was measured from the center of the display at 239 cd/m². On average the display put up a good 201 cd/m² and though the illumination rating of 76% is not anything to write home about, it gets the job done. Weaknesses here are the picture contrast of the 14-incher: with a black value of 1.53 cd/m² the panel is only able to achieve a maximum contrast ratio of 156:1. For Office-users, this is certainly suitable, but one should not expect brilliant colors in pictures and videos. 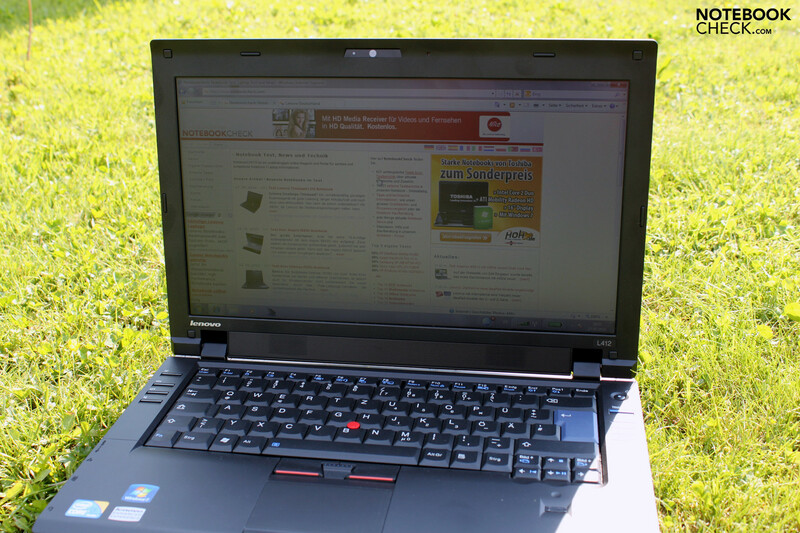 The Thinkpad L412 fares well when it comes to outdoor operation. One can achieve a satisfying outcome in either shadowy or sunny conditions. The display brightness is a bit low for a completely trouble-free experience but overall it allows one to work during a train commute without large drawbacks. Among the available viewing angles, the stability along the horizontal axis is acceptable. Viewers to the left and right of the user should also be able to recognize the display contents without difficulties. Problematic here is the vertical viewing angle, where slight deviations from the ideal angle are enough to lead to changes in how the picture is viewed. 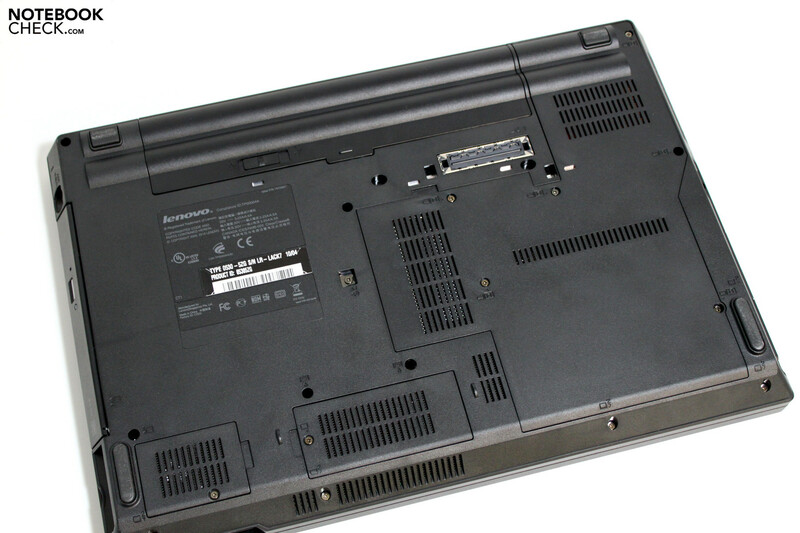 Lenovo's logic surrounding the components in the two L-series machines seems clear: that which is suitable for a 15-incher must also be adequate for a mobile 14-inch model. 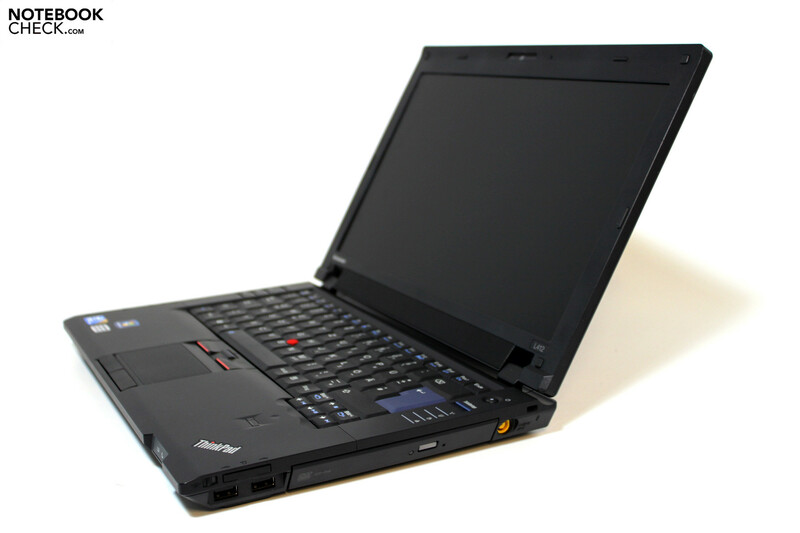 This is, in fact, just the case as the L412 seems to be an identical copy of its L512 sibling. The Intel Core i3 CPU, an Intel GMA HD graphics chip, 2 GB DDR3 RAM and, believe it or not, the same exact hard drive model, a Hitachi HTS545025B9A300. To this end, it would not be wrong to say that with the Intel Core i3-330M there is a well-performing CPU on board, though it does not support the Turbo-Boost function of the i5 and i7 dual/quad core chips. Hence, users will have to make do with the stock 2.13 GHz frequency. With a TDP (Thermal Design Power) of 35W the i3 chip isn't exactly the most energy-friendly, especially under stress. An advantage here could be, depending on the application, the included hyperthreading technology which is able to process up to 4 threads simultaneously. This is a big boost for applications optimized for multi-core use, which is comparable to the "old" Penryn-cores. The Intel GMA HD graphics chip is an integrated graphics solution, which is found directly on the CPU-unit. Its performance is well above its predecessor, the GMA 4500M HD, and is outfitted with numerous features which assist the GPU in decoding HD video material. 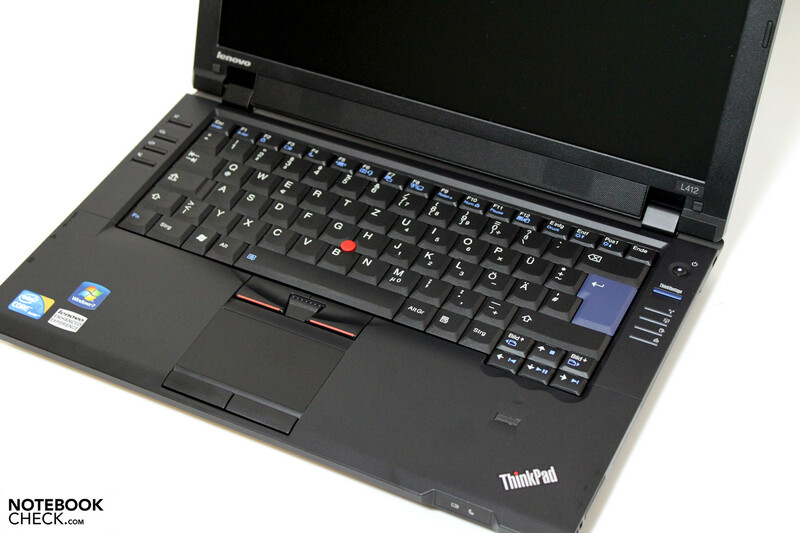 With a score of 4697 points in the PCMark Vantage benchmark test the Thinkpad L412 scores, unsurprisingly, very close to the same score as the previously-tested L512. In the immediate area here one finds a diverse selection of multimedia-notebooks. 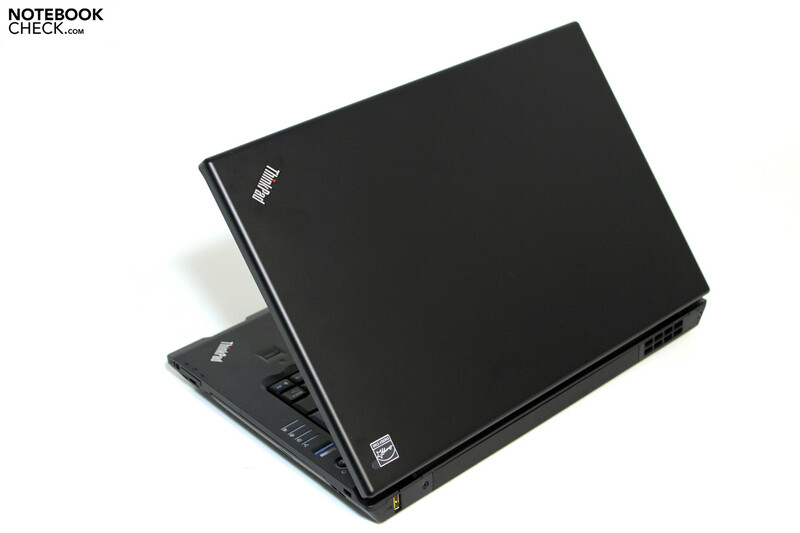 With 4464 points the Fujitsu Lifebook S710 just trails the L412 despite having a stronger i5-520M processor. 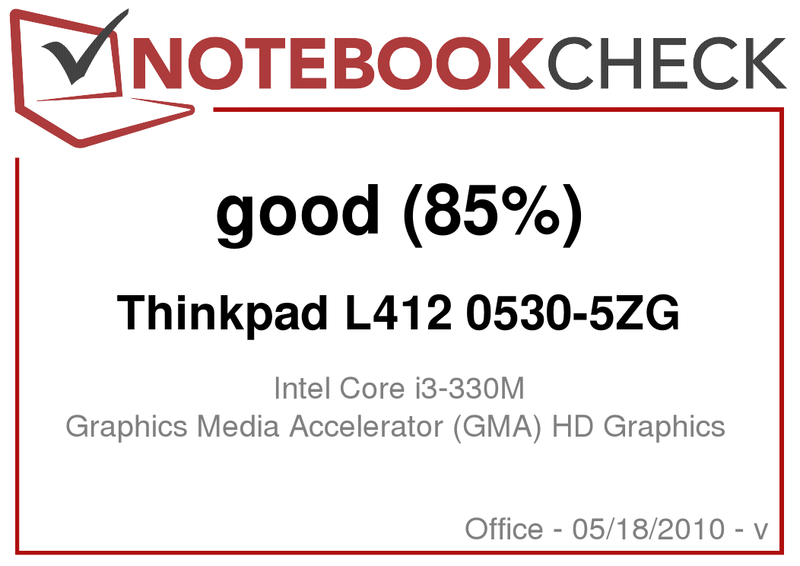 Having catapulted all the way to the top of the charts with 9047 points, the Thinkpad T410s shows that there is still room for improvement here even though it features Intel GMA HD graphics and a punchier i5-520M CPU. A deciding factor for the T410s is, among others, its built-in SSD which increases both performance and the price tag in similar fashion. The results of the Cinebench Tests (R10, R11) in the 64-bit variant lie in the lowest third of the expected values on comparable hardware. Especially striking is the comparably low value in the Cinebench Single Core Rendering Test (1932 points), which the L412 shares with the L512. 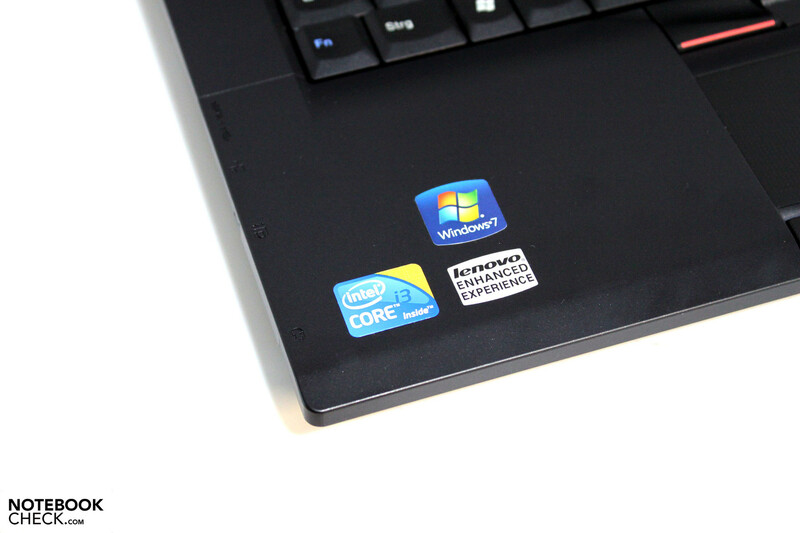 Notebooks with identical CPU are usually able to achieve up to 2900 points here, representing up to a 50% increase over the L-series' results. For this reason, we looked at the CPU in the benchmark test a bit more critically. Here, we realize that during the Single Core Rendering Test the chip practically never achieves its maximum performance of 2.1 GHz and often dips below a 1GHz clock rate. The problem does not lie with temperature, as the CPU stays at a stable level of under 50 degrees Celsius both before and after the benchmarks. It leaves one with the conclusion that there must be something (known) set to brake the system in this manner, which makes sense in the context of this test among the others in the benchmark suite. 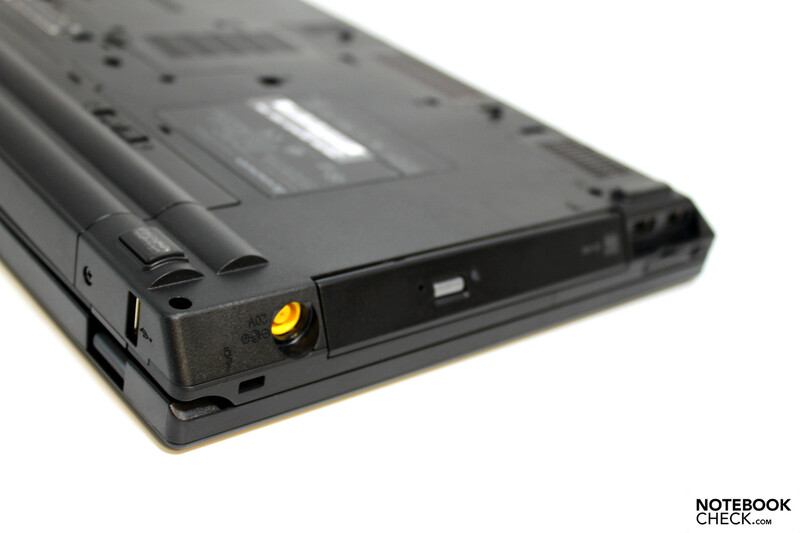 The on-duty 250GB hard drive from Hitachi, with an average transfer speed of 64.8 MB/sec, has a similar result to that of the storage drive of the same type present in the Thinkpad L512. Notable here is the access time of 23 milliseconds, a comparably high value. 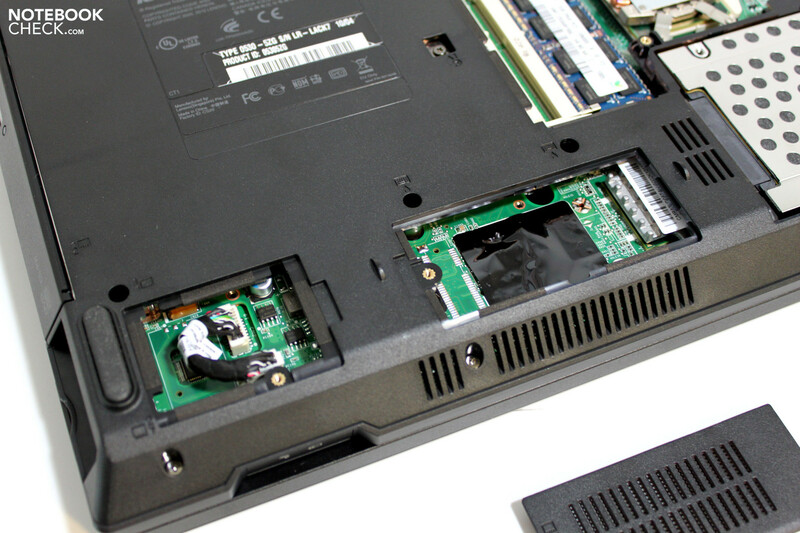 An exchange of the hard drive as well as an upgrade to the installed RAM is both possible and easy via the hatch on the underside of the base unit. Lenovo itself offers hard drives for the American market with a capacity up to 500GB and speeds of 7200 RPM. Also a consideration would be the use of an SSD though this would have to be purchased and installed separately by the user. 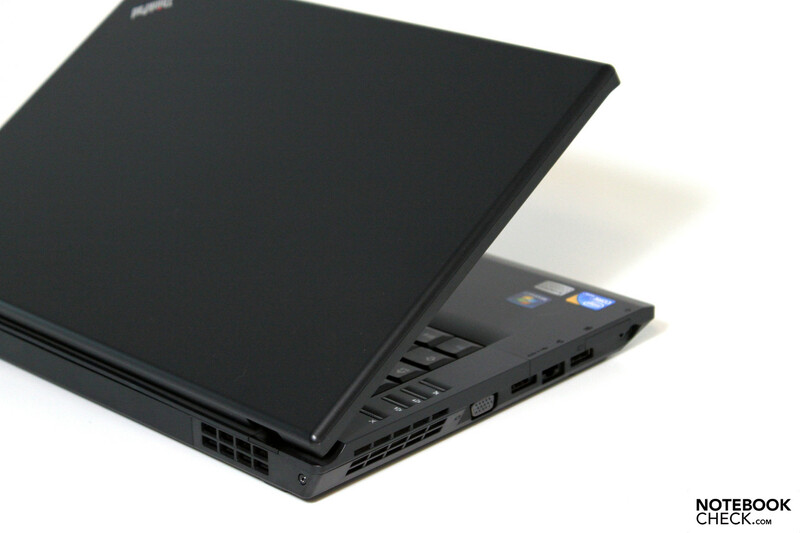 Taken on the whole, the Lenovo Thinkpad L412 would be described as a pleasant and quiet office colleague. When working on light tasks, such as editing text, internet surfing or email the notebook remains virtually silent. Every so often the cooling fan starts up for a short time to the tune of 37.4 dB(A). It would have been better to see a finer degree of fan control built in, for instance a fan that starts up earlier at lower speeds and then ramps up for a short time when necessary. This would be ideal, as the current setup prolongs turning the fan on until absolutely necessary, resulting in a higher fan speed and more noise. Altogether this depends on the individual habits of each user and how much they tax the system's resources. Under load during a stress test the cooling fan runs at a constant 37.4 dB(A), which is to say clearly audible yet not particularly disturbing. Practically speaking, a similar situation would be best provoked when replaying HD video content. We observed that the temperature of the inner components consistently remained at acceptable levels and it comes as no surprise that the surface of the case remained cool as well. During normal operation the unit warms up to 33.4 degrees Celsius around the touch pad. The underside, achieving 37 degrees Celsius, also stays cool. In a stress test the maximum surface temperature reaches 41.1 degrees Celsius in the center of the keyboard. The underside remains cooler when under stress than when at idle, no doubt due to the work of the active cooling fan turning on. (±) The average temperature for the upper side under maximal load is 35 °C / 95 F, compared to the average of 29.4 °C / 85 F for the devices in the class Office. 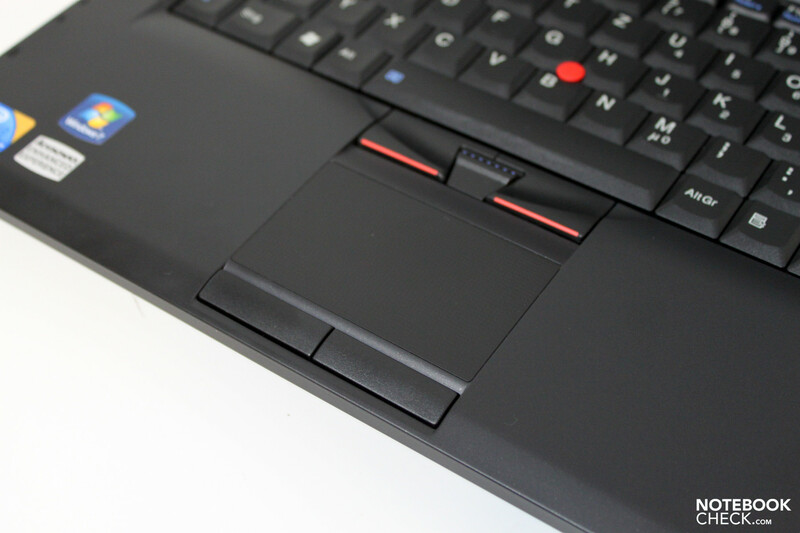 (+) In idle usage, the average temperature for the upper side is 30.1 °C / 86 F, compared to the device average of 29.4 °C / 85 F.
The loudspeakers of the Thinkpad L412 can be found inside of a perforated strip on the edge of the display. The maximum volume as well as the sound are acceptable for a compact Office notebook, though the sound is weak when it comes to the bass. The audio replay on the L412 profits from the positioning of the speakers directly in front of the user and the fact that they are not able to be covered by the positioning of the hands nor use on a soft surface. Same hardware, same battery (57Wh lithium-ion), same battery life? Not quite, as the display tips the scales a bit when it comes to energy consumption. The minimally observed usage of 8.7W brings the total consumption closer to that of the larger L512 model. Other observed values also fit well into this overall picture. Following this, the available battery life also met our expectations. With a maximum run time of 5 hours and 13 minutes and a real-world run time of 3 hours and 45 minutes while WLAN surfing (balanced profile, max. 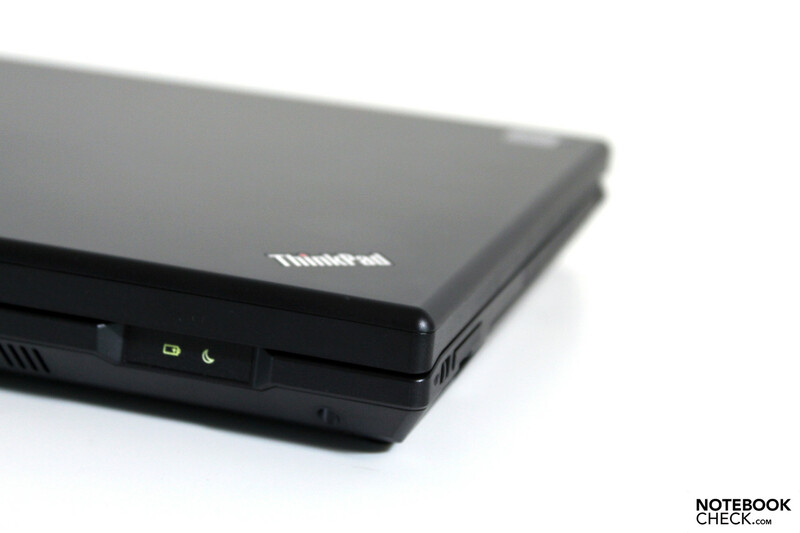 display brightness) the Lenovo Thinkpad L412 offers acceptable mobility. A possible upgrade would be to the 9-cell battery, which increases the available battery life by around 50%. 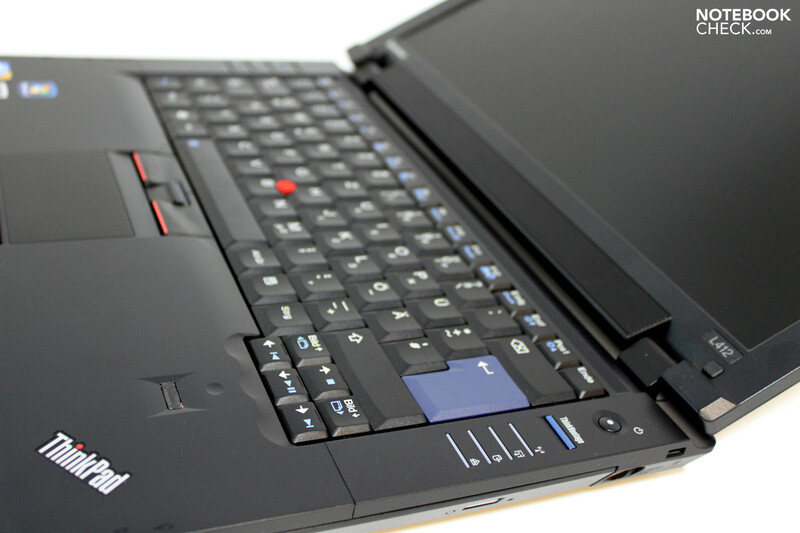 Before us stands yet another member of the Thinkpad family, rather on the lower end of the palette but still able to keep pace with typical Thinkpad features. 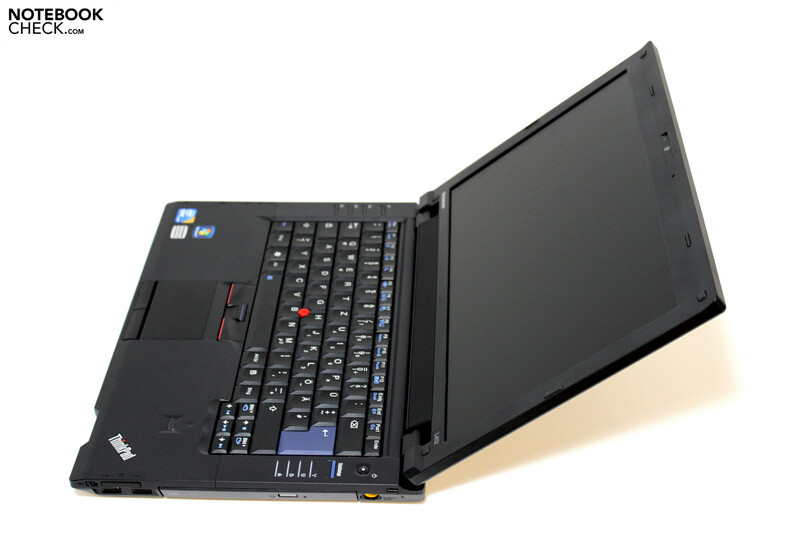 Optically the L412 follows in the wake of the (failed) Thinkpad Z-series though more agile and compact. 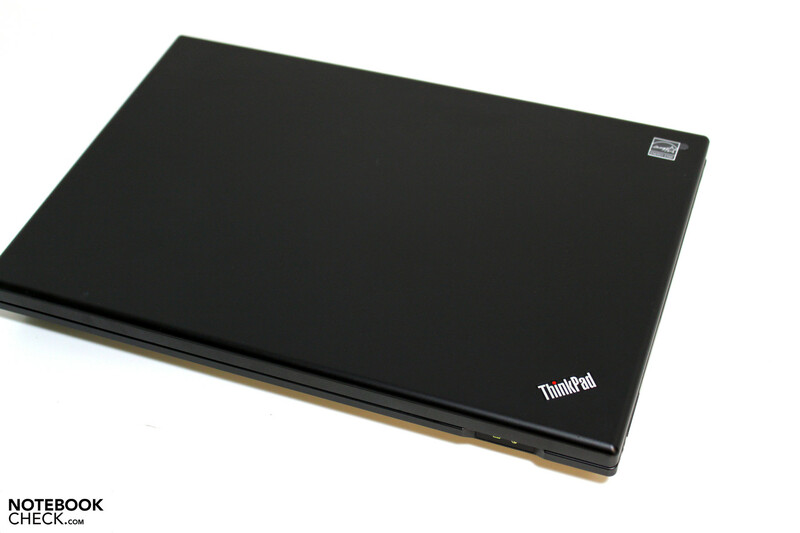 Apart from a few weak areas the case stability as well as the workmanship is on the same level as the rest of the Thinkpad family. Unfortunately, the numerous possibilities for configuration are not yet available in Europe which leaves buyers limited to pre-configured models. This would be particularly desirable when it comes to the communications module (UMTS!). 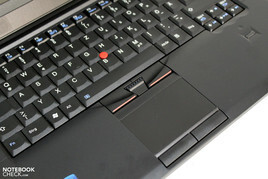 Keyboard as well as the touchpad/trackpoint combo are Thinkpad typical and offer plenty of working room. With respect to the display, one must make do for the time being with only one variant, the matte 1366x768 pixel panel in 14-inch format. It provides good brightness and the ability to work outdoors without any issues, though illumination and picture contrast suffer measurably. 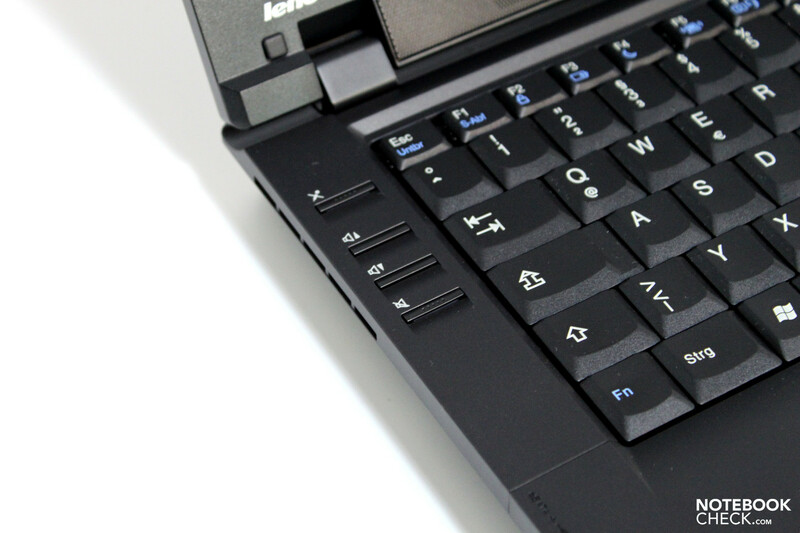 With the Intel Core i3-330M CPU, Lenovo is up-to-date with the latest processor technology, even when the complete configuration falls clearly into the entry-level segment. Also of note is that the complete performance of the CPU can not be utilized, as it was clearly limited in our tests. For light-duty tasks like Office this is a non-issue, however it is still not understandable that available performance reserves cannot be tapped for use when needed. Bright points are the volume and temperature profile of the notebook. With a possible real-world battery life from 4-5 hours, the mobility is certainly adequate. When outfitted with the 9-cell battery this furthers raises the possible battery life. Aside from the limited performance, this notebook comes recommended for users who are looking for a mobile business notebook for Office applications. An warranty upgrade from the 12-month standard warranty is however suggested. The continuance of the left-for-dead 14-inch form factor. 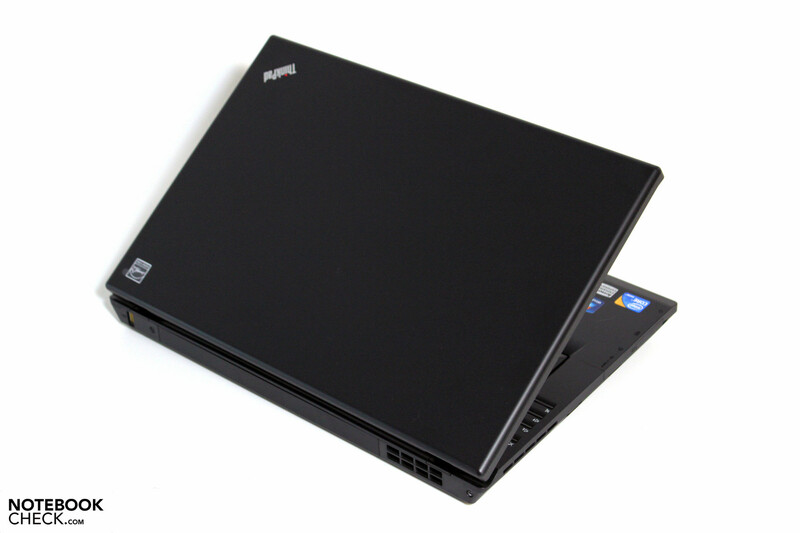 Everything which Lenovo offers in the USA regarding individual configurations.